Is It Possible To Eat Well For Under Ten Bucks? Two days before payday, I have no lunch and $7 in my wallet. There are really slim pickings for food choices around my office. Well, lots of places for a sit-down fancy-pants lunch (I work by the Capitol so lots of nice places for politicos to go), but not much for less than $10. There’s one sandwich shop, where my seven bucks would not be enough for even a plain turkey sammy. Seriously. Then there’s Quiznos, which no matter how many times I try, makes me sick every time. There’s a burger place that’s pretty cheap, but it’s greasy and also tends to make me sick. 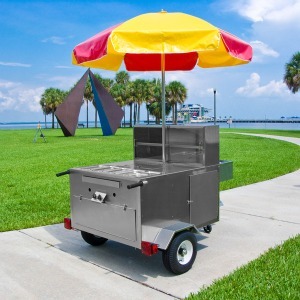 I have no choice but to go to the hot dog cart. Two dogs, chips and a soda for $4.50. Can’t beat that! I know it wasn’t a healthy choice, but what choice did I have? Well, I could have made lunch at home and not had this problem. Except the night before was a late night and I didn’t have time to make anything. I know from experience that when I don’t plan ahead, disaster is soon to follow. I keep thinking about a better choice that I could have made. I guess I could have bought an apple but then what else? I’d still be hungry and stuck with nothing. This happens to me all the time, and more times than not, I end up at the good ol’ hot dog cart. So what do you do at work when you have nothing to eat and very little money? Previous PostCheesecake Factory: Evil Temptress or Golden Opportunity?Next PostEat Like a Kid!